If money is “rotating” out of tech, where’s it going now? Beware politicians bleating about “human rights”… more eyebrows raised over the Texas Bullion Depository… a reader shakes his head at fellow readers… and more! Whoops, that didn’t last: “Amazon Stock Jumps to New All-Time High of $1,017,” screamed a CNBC headline shortly after the open today. Amazon’s acquisition of Whole Foods, noted in this space on Friday, remains the talk of the Street. But that all-time high held for only a picosecond; at last check it’s back below $1,000 a share. Barring something dramatic, AMZN will end the day below its all-time close reached earlier this month. So it goes with the rest of the hot tech stocks that have propped up rest of the market for the last two years. 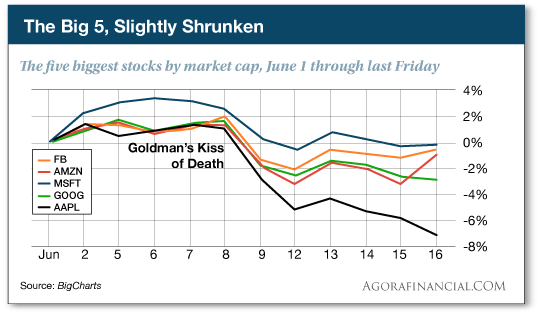 Ten days ago, Goldman Sachs issued a report declaring the “Big 5” stocks in the S&P 500 — in order of market cap, they’re Apple, Alphabet (Google), Microsoft, Amazon and Facebook — to be overvalued. That triggered an instant wave of selling. “Whenever investors pull money out of one area of the market (causing prices to drop), that capital is usually reinvested in another area,” says our income specialist Zach Scheidt. And what area might that be? “Dividend stocks are starting to get the attention that they deserve,” says Zach. That was happening even before the Big 5 fell out of bed. Check out this chart through the end of May plotting the relative performance of dividend stocks to the whole S&P 500. 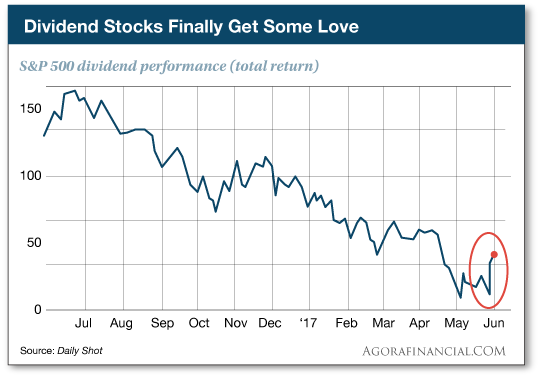 It’s not that the dividend stocks Zach favors have been losing money over the last year; rather, their slow-and-steady performance has been outdone by the S&P 500 as a whole. But again, that’s mostly because of the Big 5’s outperformance. “Now that these speculative stocks are starting to pull back,” says Zach, “dividend stocks are getting their day in the sun. And I expect this trend to continue for the rest of the year (and probably well into next year). Note well: Zach says one of the Big 5 stocks is not like the others. It happens to be the one that’s taken the biggest hit since that Goldman report 10 days ago — Apple (AAPL). Which Zach says only makes it more of a bargain. “Shares of Apple are not at all expensive compared with the earnings that the company generates,” he tells us. No doubt. After this recent pullback, Apple sports a price-earnings ratio this morning of 17. Compare that with Alphabet, Microsoft and Facebook — all in the 30s. To say nothing of Amazon, with a P/E of 189! [Ed. note: Slow-and-steady dividend stocks ultimately win the race. But if it’s instant income you’re after, and you have at least $20,000 to invest, then you’re in position to pull in up to $2,000 a month. As the day wears on, tech stocks are notching their best day in six months. The Nasdaq has pushed past 6,200… the S&P 500 past 2,450… and the Dow past 21,500. There is absolutely no news driving the tech bounce… and as noted above those Big 5 names remain below their levels of earlier this month. Doesn’t feel as if this rally has a lot of staying power. Crude rallied from its year-to-date lows on Friday, but it’s backsliding today; at last check a barrel of West Texas Intermediate is $44.57. I’ve been rethinking the similarities between trading stocks and betting in Las Vegas,” says Jonas Elmerraji — back from a recent trip to Sin City. The old saw about how “the house always wins” doesn’t hold true, he tells us: “You may have heard of the MIT Blackjack Team. The book Bringing Down the House was written about them. They made a movie about it too. The team used card counting to gain a statistical advantage over the casinos, making profitable runs every single year. “It’s estimated that counting cards gives you about a 1% edge over the house. It’s small, but in the long run, it can add up to a fortune. To combat card counters, casinos make things more complicated. They add more decks, making it harder to keep up the count. Here’s the point: Jonas ventures that his proprietary computer-driven “Kinetic Composite” is analogous to card counting in Vegas. As we said last week, using the Kinetic Composite gives you a shot at outperforming the S&P 500 by 24% every year. And the strategy can be applied to individual stocks for even bigger wins. The budget stalemate in Illinois — now two years old — has gotten so bad that the Prairie State will soon be shut out of the Powerball and Mega Millions multistate lotteries. Way back in autumn 2015, we were chronicling how Illinois was issuing IOUs to lottery winners who’d won prizes over $600. Eventually, the governor and the legislature came up with a workaround, but the state still has no budget. “We’re like a banana republic,” complains Gov. Bruce Rauner. Now the managers of the two big multistate lottery systems have served notice: Unless a budget is in place by the end of this month, Illinois will have to suspend Powerball and Mega Millions sales “until further notice,” per the Illinois Lottery website. Rumors are swirling that Illinois might soon be the first state to file for bankruptcy — too many years of overpromising pension benefits, and no legislative solution in sight. Thing is, there’s no provision in federal law for a state to declare bankruptcy; Congress would have to act first. “Why,” a reader writes after Friday’s episode, “do the same people who pander to the Cuban refugee community in Florida by demanding sanctions to punish this (gasp!) communist regime because of its human rights record rush to Vietnam to sign business deals? The 5: “Human rights” is a cudgel wielded only over regimes of which Washington disapproves. Saudi Arabia beheads people for sorcery, and the Beltway class — the current president included — couldn’t care less. “This doesn’t make sense to me,” a reader writes of the strange doings with the Texas Bullion Depository. “Unless the University of Texas/Texas A&M endowment is planning to ‘rent’ their gold as HSBC, et al. do, it is privately owned. There is no reason why the depository would have to be a Comex member. Would you or I have to be members to hold our own private gold? Something stinks. “If you put a vote to the Texas people,” writes another, “they would say screw the Comex and bring the gold home. “Texans are big boys — they could create their own exchange and own rules. Since when in today’s world does New York or Chicago have a lock on trading platforms and exchanges? They can trade gold in Texas just like they trade wheat in Kansas City. “If Texas eventually wants to secede from the union, which may come about someday, they will be glad they brought the gold home. “I don’t get it!” a reader writes in reply to some of the complaints that came in last week. “How can someone pony up the requisite hundreds or thousands for your premium services but not have a clue what they are actually getting? Being a newbie is no excuse. They should have learned all the way back in grammar school the difference between ‘monthly’ and ‘daily.’ It’s common sense! Daily = Every weekday at least. Monthly = Once a month. The 5: It might come as a revelation to some of these critics who are only now getting acquainted with us… but we really do want happy long-term customers rather than a quick buck. P.S. Did you play it? In less than two months, readers of Jim Rickards’ Currency Wars Alert bagged a 34% gain on the Canadian dollar — they were urged to cash out this morning — and they didn’t play the risky forex markets to pull it off, either. All they did was follow a one-of-a-kind strategy to “skim” the currency markets. You can do it too. Learn how at this link.